Tuesday Night Tanks happened by accident. The actual design was heavily inspired and required very little tuning after the first draft. 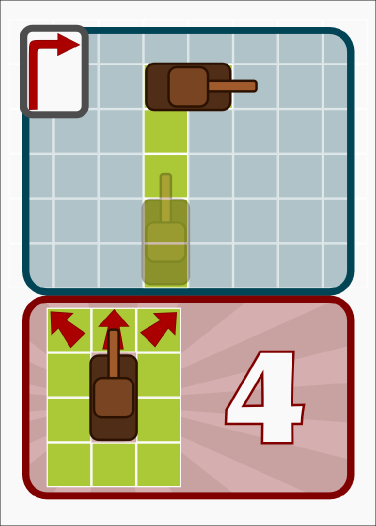 I tweaked the deck of cards some, and adjusted the maps… but the majority of the work was graphic design. I sort of live-Tweeted the design process and asked a ton of questions of my followers. Based on the majority of the community, I finished what I thought was a solid playing, and looking first design. 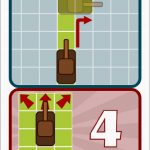 I took the first copy of the game to Protospiel and it was obvious that I was wrong. The initial design was very confusing. The arrows were covering too much of the movement path and it obscured the tank facing in some cases. I talked it over with everyone there and we thought it would be best to move the arrows off of the movement path. 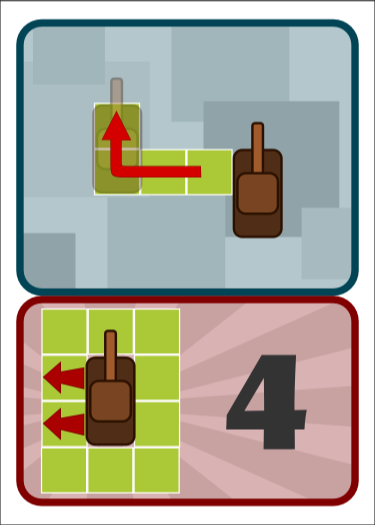 So, the initial release version looked like this. 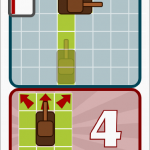 I moved the directional example into the upper left corner to make it easier to see the card type when in your hand. 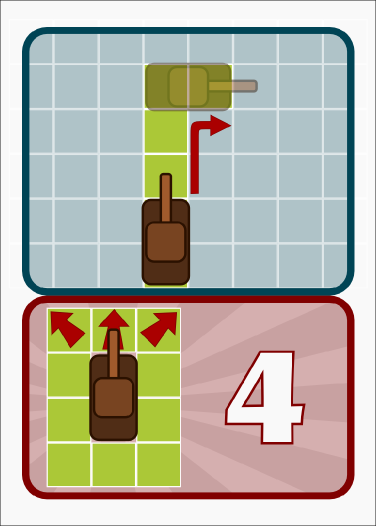 This cleared up the center of the card and made it much easier to see the exact movement path and final facing. After polling Twitter again, it was voted that the final placement of the tank should be darkened. This way, where you ended was emphasized more than where you started… which was determined to be more important. I officially released the game on The Game Crafter and it sold quite well. It wasn’t until recently… specifically GenCon and then WV PopCon… that I got to see the game in action and saw the problem with the cards. They were no longer intuitive. People kept moving their tanks in the wrong direction and were having difficulty counting the path of the tank. With the end-movement darkened, that meant those squares were covered and it made it more difficult to count it out. So, I announced a revision… and that has happened. I polled Twitter again, and everyone agreed that this version is superior. Having the movement arrows close, but not on top of things helps identify the correct movement path, without being in the way. It’s still a toss-up whether people prefer to have the starting or end location highlighted, but I chose this from personal preference. 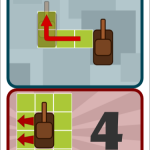 Also, with the end location faded out, it makes it easier to see the squares underneath for movement purposes. Hopefully this clears everything up. If you purchased Tuesday Night Tanks, and you want the updated command deck, simply email me your original purchase date [cheveedodd at gmail], and your address, and I’ll ship you a new deck FREE OF CHARGE. I’ll be placing the order soon, which means I should be able to fulfill this promise within a few weeks.